University of Nottingham > Blogs > Words on Words > Creative Writing > Beautiful Places and Creative Spaces: The best reading and writing spots in Nottingham. Beautiful Places and Creative Spaces: The best reading and writing spots in Nottingham. This blog was written by second year English student, Emily Hall. We are influenced so much by the World around us; by the food we eat, the people we meet and the sights we see. Therefore when looking to be creative, expressive or reflective, surely we should take more notice of the space we are in and whether it is encouraging or restricting what we wish to achieve. Since the first week of my first year as an English student, Rye Cafe has been a writer’s haven for me. With a gorgeous rustic interior, comfy lounge style seating and a great variety of food, I have spent hours sitting by the window with a book in one hand and coffee in the other (if you like people watching, definitely bag a window seat.) The relaxed atmosphere encourages creativity, and most of my first year creative writing assessments were completed on one of the incredibly comfortable arm chairs. Especially for the spring and summer months, this is one of my favourite places to get creative or enjoy some quiet reading. If you head to the cafe courtyards, the outdoor seating area is perfect to enjoy a cool ice lemonade whilst reading. 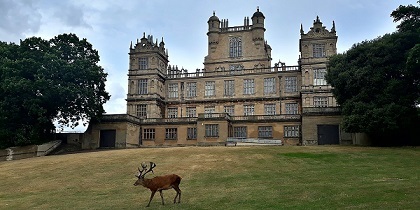 Take inspiration from the beautiful Wollaton Hall, a place of spectacular opulence and endless writing possibilities. The lake also provides such serenity and so take a leisurely walk alongside it and take some photos, which could be used as inspiration for a writing piece one day. Nothing beats a small independent bookshop, especially if you’re looking for inspiration. Full to the brim of all sorts of literature, from classics to graphic novels, Five Leaves will spark all of your literary love and remind you of why you chose to study English. If you’re lucky, there is a small table and chairs outside, which is perfect for starting a new book or jotting down some poetry ideas. Don’t be afraid to spark up conversations with people. If they’re looking at a book that you’ve read, tell them about it. Ask the shop worker if there is anything they’d recommend. Ask about upcoming events or reading groups. The more you engulf yourself in reading culture, you’ll find tons of amazing opportunities.